Thanksgiving is right around the corner — everyone is sharing all they have to be thankful for on social media, family and friends are making plans to travel near and far in order spend the day together, and grocery lists are starting to be made in an effort to prepare for a day of feasting on slow-cooked turkey, honey-roasted ham, green bean casserole, mashed potatoes and gravy, and of course — pumpkin pie. Are you ready? 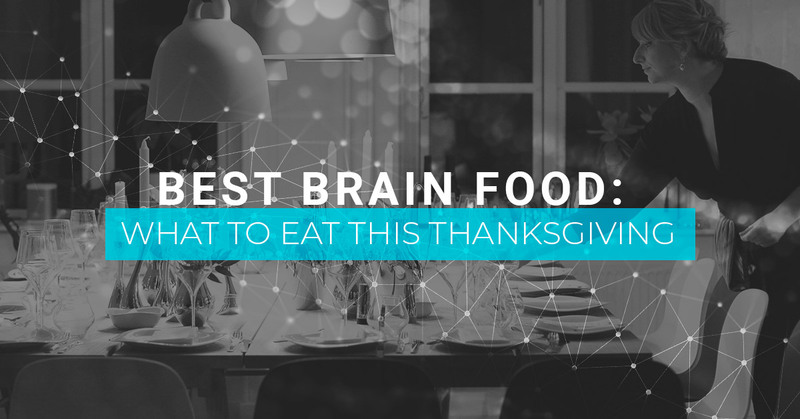 Since Thanksgiving is all about food — and it’s so quickly approaching — we’ve decided to dedicate today’s blog to the best brain food! At NeurOptimize in Denver, Boulder, and Fort Collins, we are dedicated to helping you make the best choices for your brain and hope this blog gives you some ideas on what to incorporate into your Thanksgiving dinner, as well as everyday meals to encourage optimal brain health and function. Let’s dive in. Blueberries — at some point or another, we’ve all probably heard how beneficial blueberries are for our brain and overall health. There are so many proven health benefits of blueberries, from preventing disease to lowering blood pressure, and even improving brain function and memory. The best part about blueberries? No prep! You can easily add blueberries as a Thanksgiving side — or you can make blueberry pie. Nuts and seeds are rich in healthy fats, antioxidants, and vitamin E, which prevent cognitive decline neurodegenerative diseases. Nuts and seeds can easily be added into your Thanksgiving meal as a light appetizer for your loved ones to munch on while waiting on all the food to cook. Avocados provide many nutritional benefits that enhance the functioning of your brain. Avocados are proven to increase your lutein levels, which increases your problem-solving skills and working memory. Easily add avocados to your Thanksgiving meal with avocado and pumpkin seed salsa. Your brain needs a steady supply of glucose to function, which means your brain needs whole grains. Whole grains promote good blood flow to your brain and help you concentrate better. You can easily add whole grains into your Thanksgiving dinner by making quinoa stuffing or whole grain rolls. We couldn’t talk about what to eat for Thanksgiving dinner without mentioning turkey! While turkey is the core of Thanksgiving dinner, it actually has many incredible brain benefits as well. Turkey is a rich source of protein and a great source for iron, zinc, potassium, and more that improves sustained attention, memory performance, and offers many other brain benefits. Don’t forget the turkey! By adding these “best brain foods” to your Thanksgiving meal, you don’t have to feel guilty about indulging on Thanksgiving day — you’re making the best choices for your brain. Are you struggling with stress, anxiety, depression, chronic pain, or another unwanted symptom this holiday season? Our team at NeurOptimize in northern Colorado can help. Contact us today to learn more about our neurofeedback services and how we can help you.